, a polite and ingenious scholar, was the younger son of the rev. Gideon Hardinge, and grandson of sir Robert Hardinge, of King’s Newton, a small hamlet in the parish of Melbourne in Derbyshire, who was knighted in the civil wars. 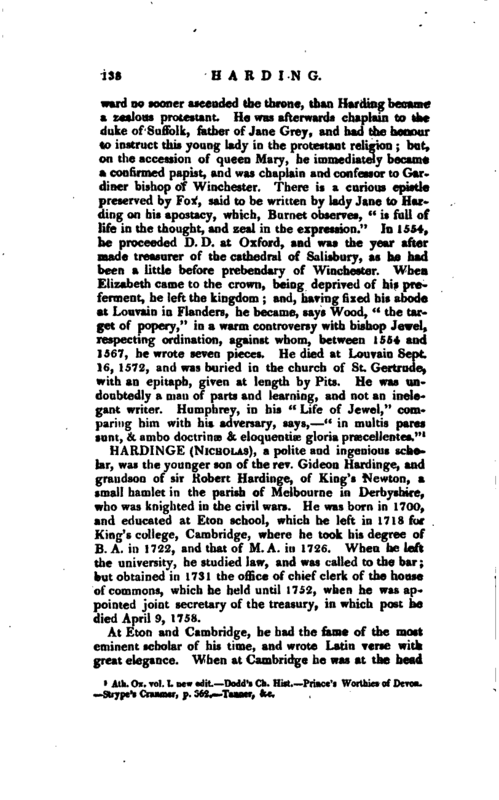 He was born in 1700, and educated at Eton school, which he left in 17 Is for King’s college, Cambridge, where he took his degree of B. A. in 1722, and that of M. A. in 1726. When he left the university, he studied law, and was called to the bar; but obtained in 1731 the office of chief clerk of the house of commons, which he held until 1752, when he was appointed joint secretary of the treasury, in which post he died April 9, 1758. At Eton and Cambridge, he had the fame of the most eminent scholar of his time, and wrote Latin verse with great elegance. When at Cambridge he was at the head | of the whig party, which happened to prevail in a contest respecting the expulsion of a student, who, in one of the college exercises had offended the tories. In this contest he made himself master of the law and custom of visitatorial power, which he discussed in a very masterly essay; but this, although intended for publication, has not yet appeared. 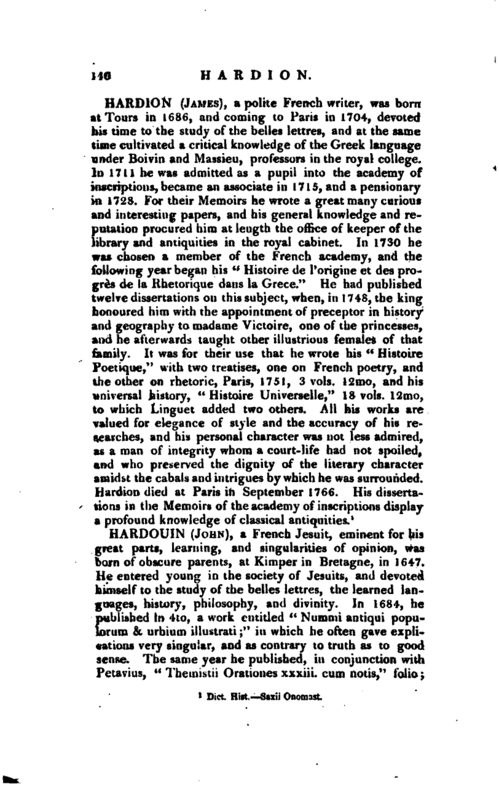 He was a very profound and judicious antiquary, particularly in what concerned English law and history. At the request of William duke of Cumberland (to whom he had been appointed, in Dec. 1732, law-reader, and was afterwards his attorney-general), he wrote a very learned memorial upon the regency (when that subject was agitated in the last reign), which lord Hardwicke called “an invaluable work.” It was by Mr. Hardinge’ s advice and encouragement that Mr. Stuart undertook his journey to Athens, with a view of illustrating the history of that city. His diligence, accuracy, knowledge, and skill, in the office of clerk to the House of commons, were never exceeded. He put the “Journals” into their present form; and drew up a very able report of the condition in which he found them. In his office of secretary he was laborious, able, and zealous; and so honest, that he had many enemies. He was chosen representative for the borough of Eye in parliament in 1748 and 1754, and was a very useful member; but had no talents or courage for eloquence, though his taste in estimating it was exquisite. 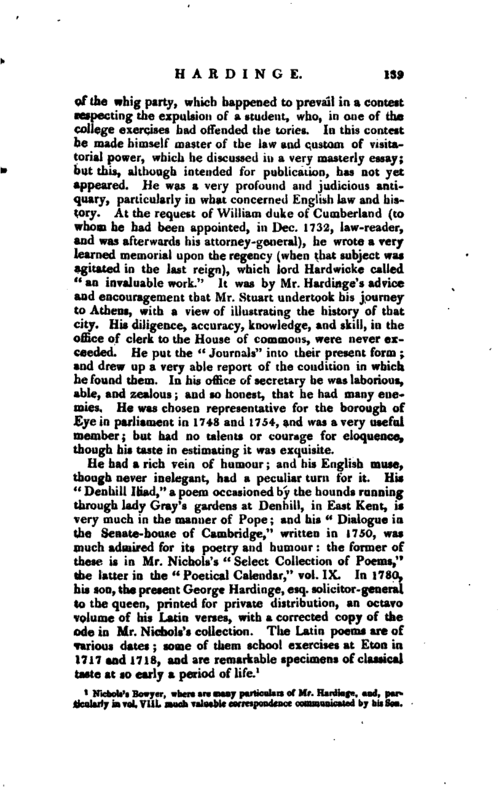 1 Nichols’s Bowyer, where are many particulars of Mr. Hardinge, and, particularly in vol. VIII. much valuable correspondence communicated by hisSoa.